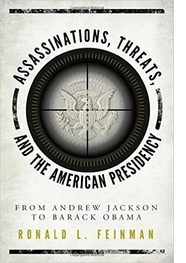 Ronald L. Feinman is the author of Assassinations, Threats, and the American Presidency: From Andrew Jackson to Barack Obama (Rowman Littlefield Publishers, August 2015). A paperback edition is coming in March 2017. 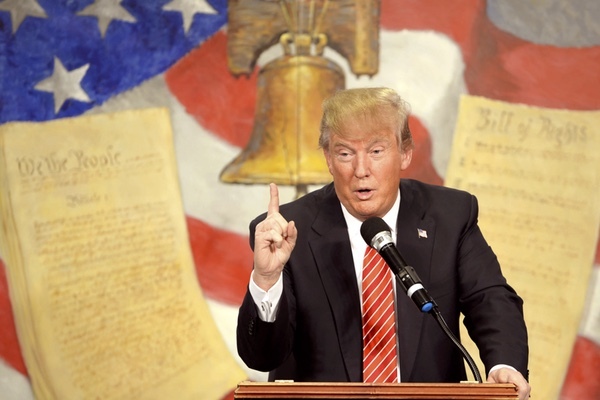 Through all of the debate, discussion, analysis, and interpretation about Donald Trump over these 15 months since his candidacy began, it has all been about him being the Republican Presidential nominee, and the upcoming election against Hillary Clinton. With all of Donald Trump’s actions and statements, each of which many observers thought would doom him, he has prevailed, despite outrage and shock at what he has said and proposed. The only solace sane Americans have had is the assumption that Donald Trump will NOT win the Presidency, and early public opinion polls make it seem likely that he has little to no chance to be elected President. But one can never be sure how political events will transpire over the next two months until November, and if something untoward on a massive level were to occur, all bets are off, and the supposed “impossible” could occur. So therefore, attention needs to be paid to the idea that we COULD have a President Donald Trump, and to plan for and wonder what that would be like, and it is not a pretty picture that can be painted about the next four years under a President Trump. It is hard not to believe that a President Trump in office would be a constant constitutional crisis, unmatched since the Civil War, and maybe even possibly worse than that terrible event’s impact on the nation. After all, in the mid 19th century, we were a nation of about 31 million people in a world where we were not a major international player in diplomacy and war, and were still in great isolation from foreign influences greatly affecting our national security. We were also a nation with far less diversity in ethnicity and religion than we are in 2016. Today, in a world of nuclear weapons and widespread terrorism, and with a population of over 320 million people, the impact of a President Trump would be massive on foreign policy and domestic tranquility. A President Trump would force all of us to be constantly alert and vigilant for one constant crisis after another, being provoked by an egotistical narcissist unmatched in American history, and only matched by a few foreign dictators over five thousand years of history. We have seen that Donald Trump has a very loose mouth, and loves to insult, denigrate, degrade, and belittle anyone or any nation who dares to challenge his beliefs and ideas centered around his clear racism, nativism, xenophobia, and misogyny, among other sins and faults that he possesses. He is accustomed to consulting only with himself, and his “superb” brain and intellect, proud of his education and good looks, all of which by being expressed, shows he is extremely insecure and doubtful about his own natural gifts. Being a businessman who began adulthood with a golden spoon in his mouth, Trump managed to have many business failures and bankruptcies; to have three wives and two divorces mixed in with adultery on a regular basis; to show a lack of ethics, morals, compassion, or concern for others; and to show his lack of patriotism by avoiding taxes through legal and accounting tactics only open to the privileged. He has pledged to do many things to improve the lives of average people when he has no clue about what they go through daily, and has divided America by race, religion, ethnicity, gender, and sexual orientation by his utterances, pledges, and inability to show empathy, even in a time of tragedy. It is always about himself, and he lacks any statesmanship or dignity in his dealings with others. So one can project that even with a Republican Congress, there would be no or little cooperation with party leaders and that he would have cabinet members and advisers only willing to accede to his demands and wishes, and would ignore anyone who challenged his beliefs and views on every subject. This is not a man of negotiation and compromise, since he knows “everything” about every imaginable topic. The thought that he would pick new Supreme Court Justices with his lack of respect for the courts of this land is a potential constitutional disaster for any concept of justice and equality in the legal system of the nation. Also, Trump has alienated many foreign leaders and governments, including friendly nations, by his statements and actions and declarations of his intentions including the future of the North Atlantic Treaty Organization; our alliances with South Korea and Japan; and our dealings with the Middle East cauldron. His wooing of Russian President Vladimir Putin and North Korean dictator Kim Jong Un is absolutely horrifying to our military leadership, our national security and intelligence community, and our diplomatic personnel worldwide. All of these groups are alarmed at a “loose cannon” like Trump, who by his words alone, could cause massive international crises that could endanger American troops, diplomatic personnel, and our basic ability to protect and defend our interests in the dangerous world we live in. So it seems likely that a President Trump might so antagonize our party system and legislative branch, and be seen as a threat to domestic tranquility, encouraging by his lack of tact the possibility of internal bloodshed. White supremacists and hate groups have flocked to his support, and he has gained the support of extremists such as Stephen Bannon of Breitbart News and Roger Ailes, formerly of Fox News Channel. Trump had the gall to make an offhanded threat to the life of his opponent, Hillary Clinton, a shocking development, occurring, ironically, on the 42nd anniversary of the resignation of Richard Nixon, the most dangerous man ever to be President of the United States, as this author pointed out in a previous HNN article. Many seem to think that he will gather around him “outstanding” people, when every indication is that no responsible Republican or conservative thinker will embrace him. The growing fear of Trump taking America into wars by executive action and having access to the nuclear codes stirs anxiety that we would see Fascism arising, and multitudes backing him in his maniacal behavior. Trump’s attacks on a free media to report and investigate every event and action of a Trump Presidency seen already in evidence by his banning of the Washington Post from his rallies and his condemnation of the New York Times and other news media. If perpetuated in a Trump Presidency, his behavior would create massive alarm and undermine our economy, stock market, and the First Amendment. His proposed mass deportation of millions of undocumented immigrants and the building of a Mexico Wall would create an environment inciting massive reaction and social uprisings and bloodshed. So we might have a constitutional crisis requiring the impeachment process. Probably, support for the effort would come from both major parties, but given the slow workings of an impeachment inquiry, we would be endangered in the interim by a beleaguered President Trump. So when Gerald Ford, upon succeeding the resigned Richard Nixon, said that the great national nightmare was over, it might have been a tentative statement for the time, subject to renewal by a growing threat to our freedom and security four and a half decades later. Wisdom and courage might be needed in the next few years, if somehow, Donald Trump becomes the 45th President of the United States.